(load test) targets (web applications). up      Start a batch of load testing servers. attack  Begin the attack on a specific url. down    Shutdown and deactivate the load testing servers. report  Report the status of the load testing servers. The number of servers to start (default: 5). the URL you wish to target. -u URL, --url=URL   URL of the target to attack. The POST file to deliver with the bee's payload. The MIME type to send with the request. all completed bees (default: ''). be returned with the report details (default: None). Bee i-55be954c is ready for the attack. Bee i-54be954d is ready for the attack. Bee i-57be954e is ready for the attack. Bee i-56be954f is ready for the attack. 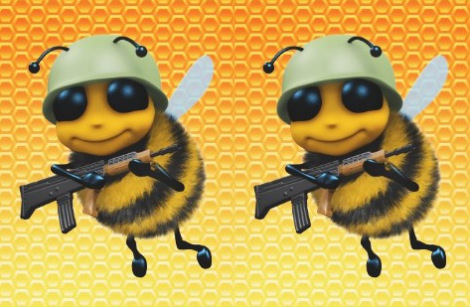 Each of 4 bees will fire 250 rounds, 2 at a time. Bee 2 is firing her machine gun. Bang bang! Bee 0 is firing her machine gun. Bang bang! Bee 1 is firing her machine gun. Bang bang! Bee 3 is firing her machine gun. Bang bang! 2010.07.08 / Bees with machine guns! Low-cost, distributed load-testing using EC2.